Onomichi is a sleepy harbour town located on the mountain range along the Seto Inland Sea. A place often overlooked by foreign visitors, Onomichi remains a hidden gem to be discovered. The town is the perfect spot to get away from modern life, take in the sea breeze and get lost for a moment in daydreams. Still not convinced? Here are 5 reasons why you absolutely should visit Onomichi. The scenic view from Mt. Senkoji. Going up the hill and surrounding mountains of Onomichi, you’ll be amazed by the charming view of the numerous Shikoku islands in the distance, especially scenic during sunset. Hiking up is steep but you can also take the Mt. Senkoji Rope-way up and walk around. The mountain is dotted with shrines, small temples. 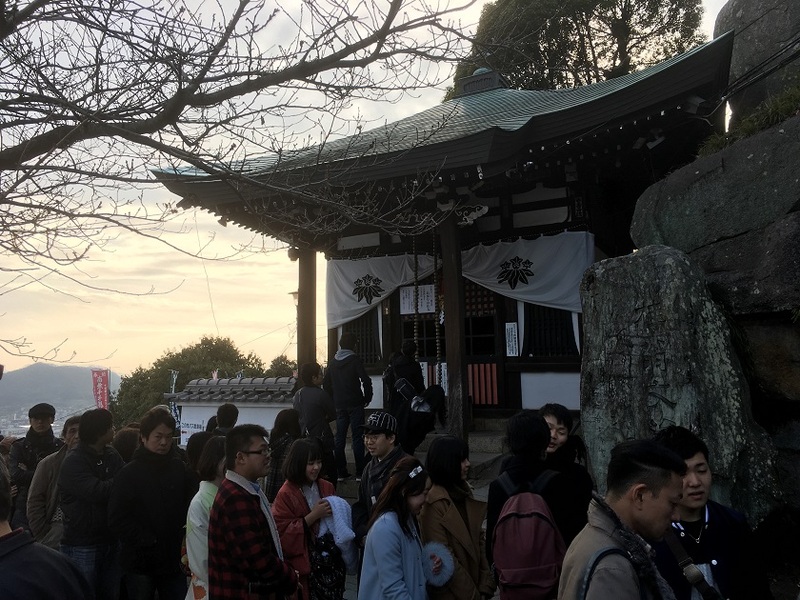 Walking down the mountain, you’ll follow the Path of Literature (文学のこみち Bungaku no komichi) with Japanese poems cut into the stone at the place where they were first conceived in times long past. Stand in front of them and for a moment re-live centuries past. The Onomichi old temple walk is a 2.5 km stroll passing 25 of Onomichi’s best known temples. It’s pleasant going through the narrow alleyways and residential areas. It’s the perfect way to soak up the local atmosphere and just chill out for a while. 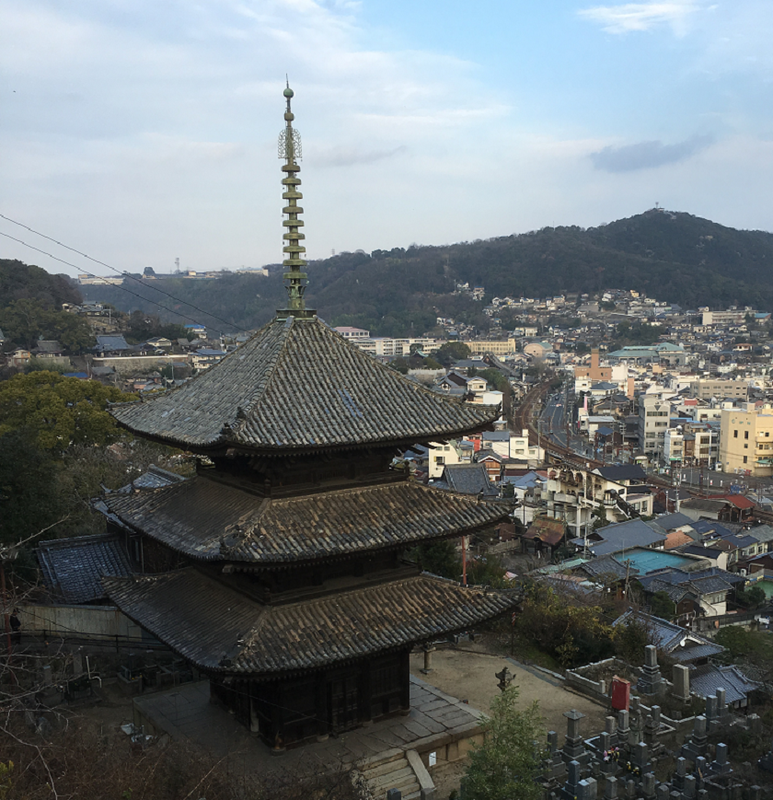 The path meanders through the hills Onomichi is built on with panoramic views along the way. The path can be started at any time but we recommend doing so at the bottom of Mt. Senkoji, as here it crosses with the Path of Literature. If you’re into Ramen, then you’ll love Onomichi. The local style of Ramen is famous across Japan and certainly one of the tastiest we’ve tried. There are many different Ramen stores across the city, some open until late. The signature taste starts with a soup based on soy sauce flavoured by small fish caught in the Seto Inland Sea with added soy sauce, add the locally pressed noodles with a variety of meat or fish and you have the perfect bowl of Ramen. Onomichi is the start of the Shimanamikaido, a 70km long cycling road connecting Honshu with Shikoku, travelling through 6 islands in the Seto Inland Sea. Bicycles can be rented and returned at either side of the Shimanamikaido, or be picked up anywhere along the route by bus if you get tired. The route is simply amazing to cycle with the coastline of Honshu on one side and the islands of Shikoku on the other. For details, see the official webpage. Shopping arcade or Ichibangai Shōtengai, a classic Japanese shopping arcade or promenade, starting at JR Onomichi station and almost going the full length of the city. It has all kinds of shops from local kitchen wares to fishing materials, souvenirs and plenty of Ramen shops. Don’t expect the standard departments stores here, instead you’ll see many that cater to local needs. It’s a nice and varied walk into town too. Getting to Onomichi with the Japan Rail Pass. Onomichi is located about 100 km west of Hiroshima and 250 km from Osaka and is accessible by rail. The best way is to take the Sanyo Shinkansen to Fukuyama station, this can be from either the Hiroshima or Osaka direction. At Fukuyama, transfer to a local JR train bound for Onomichi. The full route takes about 1 hours from Hiroshima or about 2 hours from Osaka. 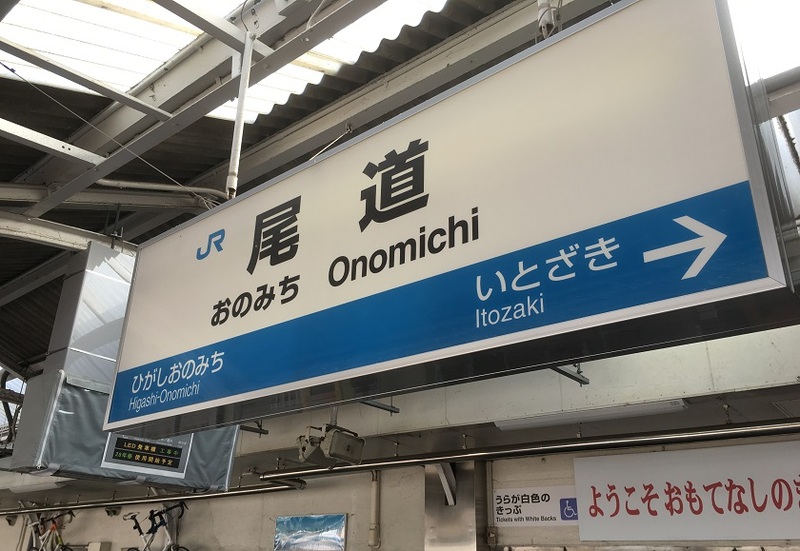 The route itself is worth experiencing, riding the hyper-modern Shinkansen to Fukuyama, then changing to the old local train to Onomichi is the perfect introduction for your visit to Onomichi.